This is a cute classic lace peplum pencil dress that is chic and sophisticated for any party you attend--and there are two color options for you to choose from! The Ladylike Lace Peplum Pencil Dress is fully lined and made entirely of lace. It has a strapless sweetheart neckline and lightly padded bust. Fabric piping at the bust adds contrast to this flirty look. The banded empire waist gives way to the attached pencil skirt with a peplum detail at the waist. A hidden back zipper completes this dress. The Ladylike Lace Peplum Pencil Dress would look nice paired with pumps or strappy heels and delicate jewelry. This is a really cute cocktail dress that will stand out in the crowd. Details: Made in USA. Fully lined. Lightly padded bust. Hidden back zipper. 95% nylon, 5% spandex. Shell 2: 74% polyester, 23% rayon, 3% spandex.Lining: 100% polyester. Hand wash cold or dry clean. Small measurements: Length from top of bust to hemline: 28". Bust: 30". You have added Ladylike Lace Peplum Pencil Dress in Beige into Wishlist. You have added Ladylike Lace Peplum Pencil Dress in Beige for Stock Notification. 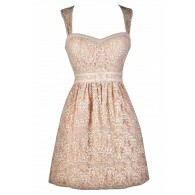 You have set Ladylike Lace Peplum Pencil Dress in Beige as a loved product. You have removed Ladylike Lace Peplum Pencil Dress in Beige as a loved product.